If you haven’t noticed already, you’re about to. Suddenly everyone’s playing, Pokémon Go. Soon you’ll notice masses of people gathered in one spot, say a public park, holding their phones in the air. Pokémon Go is an app that demands its users collect Pokémon (short for pocket monsters) that are hanging out in real spots around the globe (in augmented reality). In the game, certain locations are named as “gyms” where you can battle your Pokemon against another team’s Pokemon. The Westboro Baptist Church in Topeka, Kansas was designated as one such gym and a team has taken it over using a monster called a Clefairy. 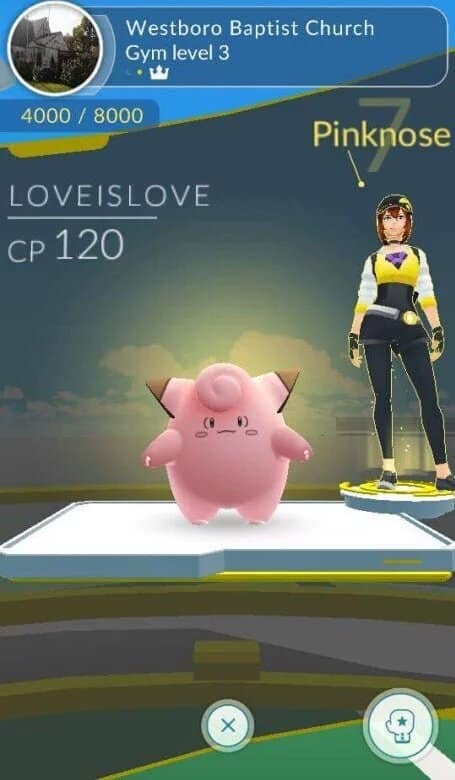 That Clefairy is named, appropriately, “LOVEISLOVE”. The hateful church, known for being active on social media, is not sitting this one out quietly. They have already responded. “We try to speak whatever language is being spoken,” said Steve Drain, an elder at the church. Drain considers Pokémon Go light entertainment that some might idolize over religion, but the way he sees it, if the church can get its message across using a pink animated creature from the game, why not? “Pokémon Go and sin no more. That’s what the lord Jesus Christ said,” he added. The church has gotten a mix of responses on social media, from those expressing support and criticizing it. One person challenged the group to a Pokemon battle.